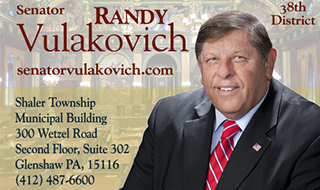 Senator Randy Vulakovich was elected to serve in the Pennsylvania Senate in August 2012 and represents the 38th Senatorial District. Senator Vulakovich serves as Chairman of the Veterans Affairs & Emergency Preparedness Committee and as Vice Chairman of the Aging and Youth Committee. He is a member of five other Senate committees: Appropriations; Communications and Technology; Judiciary; Majority Policy; and Transportation.